TILT Biotherapeutics Ltd is the leading company globally working in the area of enabling tumor T-cell therapy and checkpoint inhibitors with oncolytic viruses. TILT Biotherapeutics is developing a new treatment for cancer using oncolytic immunotherapy. Advanced solid tumors are difficult to treat with limited treatment options available. However, preclinical data on TILT® technology, alone and in combination with other immunotherapy agents (such as T-cells and checkpoint inhibitors) have demonstrated 100% cure rates. There is a significant unmet medical need and market potential in checkpoint inhibitor refractory solid tumors, which the company aims to target. 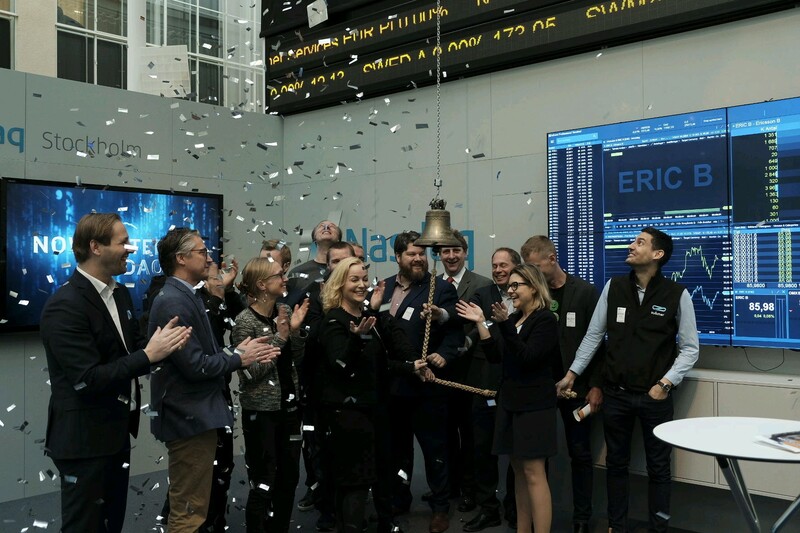 TILT Biotherapeutics was founded in 2013 and its lead product (TILT-123) is soon entering clinical trials with regulatory submissions already initiated and 12M€ of funding secured. 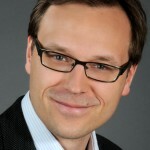 Timo Ahopelto is an experienced serial entrepreneur with a strong track record in the health care and biotechnology area. He was the founding CEO for CRF Health, the global leader in electronic Patient Reported Outcomes technology and services for clinical R&D, today serving most top-tier pharmaceutical companies globally. At CRF Health, in addition to being a vital part of over 150 clinical trials, Ahopelto started two spin-outs in interactive drug marketing and corporate wellness technology. 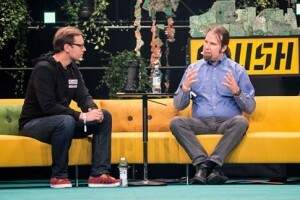 After CRF Health, Ahopelto founded Lifeline Ventures, which was a first investor and adviser in SuperCell, Valkee, ZenRobotics and Oncos Therapeutics among others. Ahopelto has extensive experience in all aspects of company building and organizing funding. 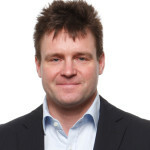 Arto Linnervuo is a Partner with a leading Nordic law firm Roschier. 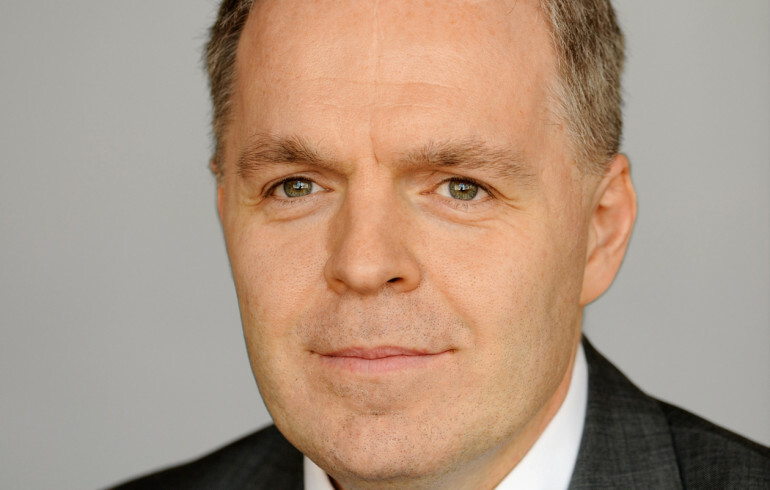 He has less than 20 years of experience in advising companies on technology-based industries. In addition to multinational corporations, he continuously advises tech start-up and growth companies on a broad range of legal matters. Well-recognized international legal directories such as The Legal 500, Chambers Europe and Best Lawyers rank Arto Linnervuo among Finland’s leading lawyers in the field. 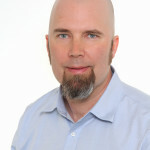 Dr Riihimäki is an experienced medical entrepreneur and investor. 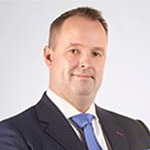 He was co-founder, human resources manager and a key executive of MedOne Oy, a pioneering private health-care provider in Finland. 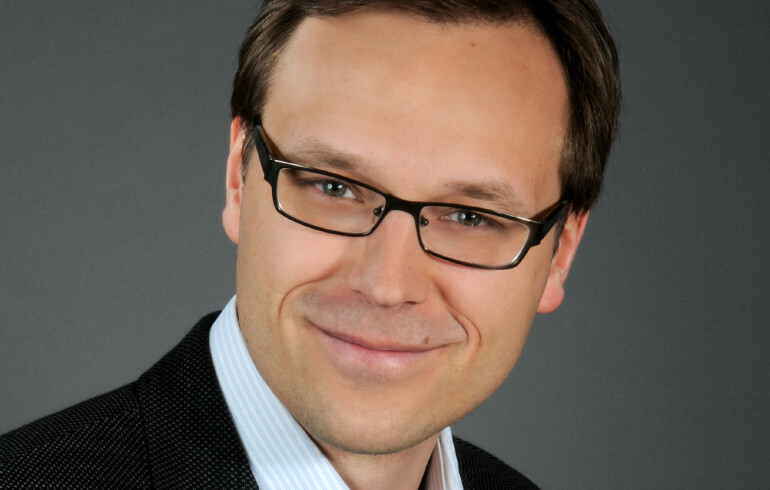 Following sale of MedOne to Attendo Inc., Dr Riihimäki has been active in both investing and playing a hands-on role in the health care industry. For example, he was CEO of Silmäasema Fennica, a chain of opticians and ophthalmologists. He had a major role in making the company the nationally leading brand, and then took a step back to act as the Chairman of Board. 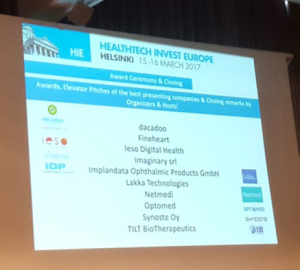 He has been Chief Physician of several local municipalities in Finland and recently started as CEO of Seniorirahasto Ltd.
Brigitte Dreno is Head of the Cutaneous Oncology Department and head of the GMP Unit of Cell and Gene Therapy at Nantes University Hospital in France. She is a global leader in the clinical implementation of innovative approaches for the treat of melanoma and other skin cancers. She has performed more than 100 clinical trials in this area, including 20 trials using adoptive cell therapy. In one of those trials she used a virus vector with the goal of enhancing the effect of the treatment. Of note, she published in 2003 and 2007 the first randomized trial in adjuvant TIL therapy of Stage 3 melanoma, showing after a follow up of more than 12 years a significant increase of overall survival in the subgroup of patients with one melanoma invaded lymph node. A phase III trial in the adjuvant situation including only stage III with one invaded lymph nodes is ongoing and results will be available in 2016. She has published more than 400 peer reviewed papers in international journals, most of them in the best journals in the field of cancer research, immune-oncology and including the New England Journal of Medicine. Professor Viktor Umansky has studied tumor related immunosuppression for several decades. His work led him to use adoptive cell therapy and to study the immunosuppressive mechanisms, which limit its activity. He is a global leader in understanding tumor mediated immunosuppression and the models that are used for studying it. He works at the leading European Cancer Center DKFZ in Mannheim and Heidelberg. Dr Umansky has published 103 peer reviewed papers, and many of these were on various aspects of interactions between tumor and immune cells. 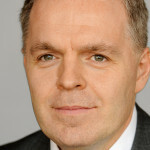 Petri Bono is Director of the Cancer Center at Helsinki University Central Hospital, the only OECI approved Comprehensive Cancer Center in Northern Europe. There are over 100 MDs and more than 16.000 patient visits to the Center every year making it one of the largest cancer centers in Europe. 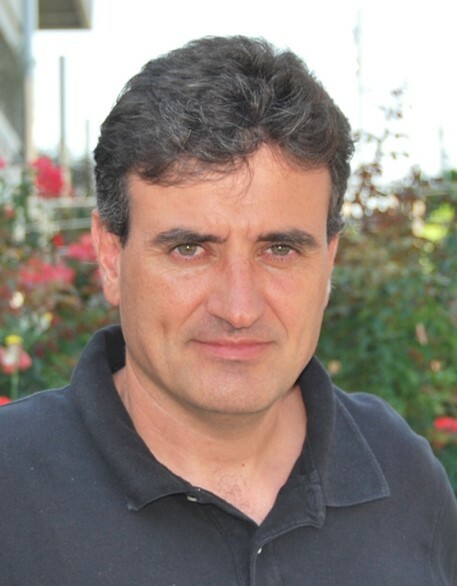 Dr Bono’s own research has involved many areas of molecular and immunological oncology. As he did his PhD in basic and applied immunology, he is uniquely suited to drive immune-oncology forward clinically. Dr Bono has participated in numerous clinical trials including early phase immuno-oncological trials and published 60 peer reviewed papers in international journals. 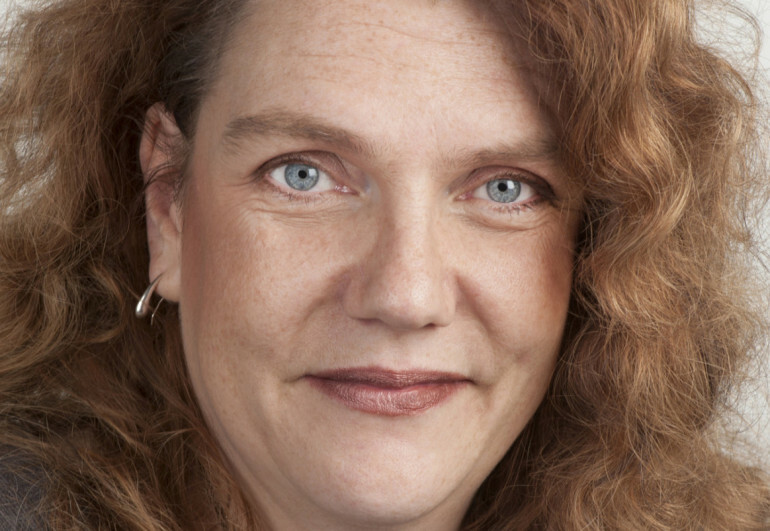 Tanja de Gruijl heads the Immunotherapy and Immune-monitoring Lab at the VU University medical center-Cancer Center in Amsterdam, where she has been appointed Professor of Translational Tumor Immunology and holds a Fenna Diemer Lindeboom Chair. She has over 20 years of experience in the field of tumor immunology with over 150 peer-reviewed publications to her name. Her research ranges from preclinical topics to immune-monitoring of Phase I-III clinical trials. Her main line of research is the in vivo targeting and modulation of dendritic cells (DC). Further topics of research include tumor-mediated immune suppression, control of DC differentiation, the effects of cytostatic drugs on DC development and functionality, and the immune potentiation of tumor-draining lymph nodes and the tumor microenvironment. Her research has been supported by fellowships and grants from the Netherlands Organization for Scientific Research (NWO) and the Royal Dutch Cancer Society (KWF) and she is a recipient of a competitive research award of the Prostate Cancer Foundation. 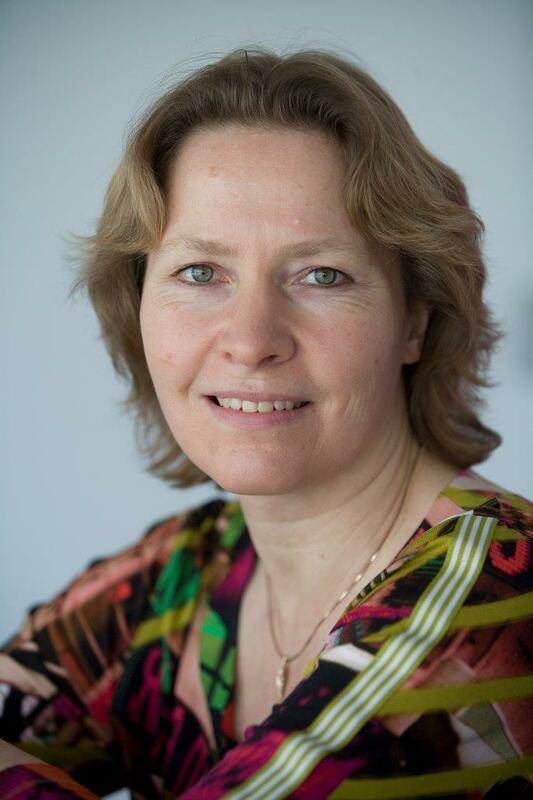 She is a member of the Grant Review committee of the Melanoma Research Alliance, a member of the scientific council of the Dutch Cancer Society (KWF), Associate Editor of Cancer Immunology Research, and currently chairs the Dutch Tumor Immunology Working Party. 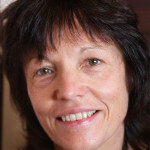 Inge Marie Svane obtained her MD from the Faculty of Health Science, University of Copenhagen, Denmark (1992) and subsequently her PhD (1997). 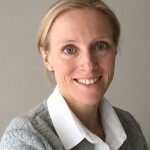 Professor Svane has held several clinical positions during her professional career, and is currently a Consultant and Head of Immunotherapy at the Department of Oncology, Herlev University Hospital (since 2008). 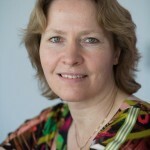 She is Head of disseminated melanoma treatment in Eastern Denmark, In addition, Professor Svane is Director of the Center for Cancer Immune Therapy, Herlev University Hospital (since 2006), Professor of Clinical Cancer Immunotherapy, Faculty of Health Sciences (since 2009), and Chairman of PhD Education in Clinical Cancer Research (since 2010). For the last ten years, Professor Svane has been committed to teaching and supervising undergraduates, postgraduates and postdoctoral scientists at The Faculty of Health, University of Copenhagen. Her scientific research interests are in the treatment of melanoma and immunotherapy. 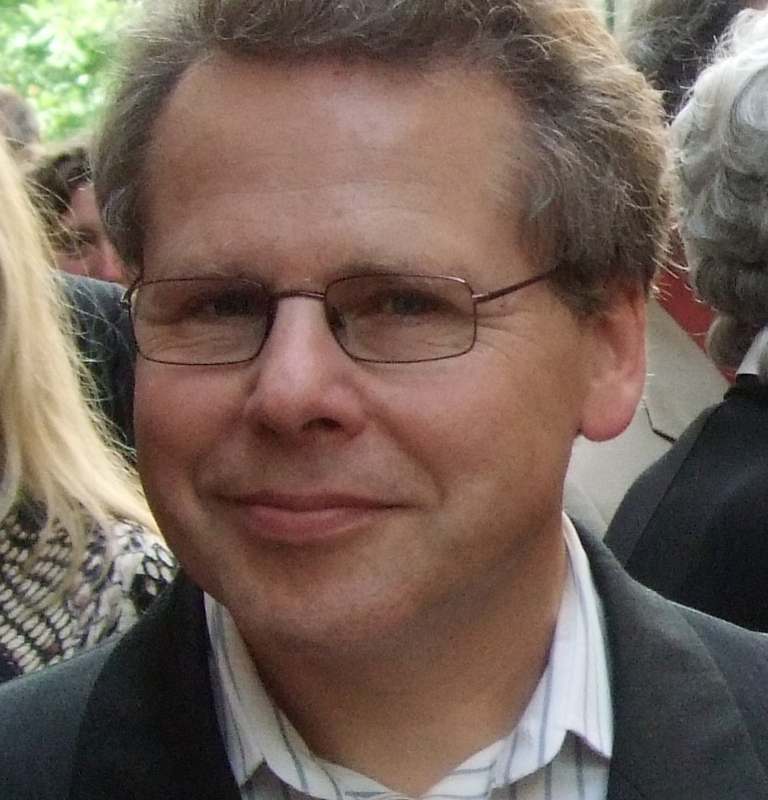 Professor Svane has an extensive publication record, authoring more than 100 scientific publications. 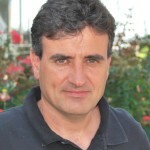 Ramon Alemany is Doctor in Biology/Genetics by the University of Barcelona, Spain. In 1993 he began working on adenoviruses for cancer gene therapy as a postdoct at the MD, Anderson Cancer Center, Houston, TX. His research on adenoviral vectors and oncolytic adenoviruses applied to cancer therapy continued in Baxter Healthcare, Round Lake, IL, and later at the University of Alabama in Birmingham, AL. In 2001 he returned to Barcelona to lead a research a group on cancer virotherapy at the Catalan Institute of Oncology. He has published more than 100 original articles and 14 patents on the therapeutic use of adenovirus against cancer. In 2009 he co-founded VCN Biosciences. Suvi Sorsa has extensive experience in cancer biology and gene therapy, especially with oncolytic viruses. 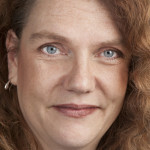 She has co-authored dozens of scientific papers with an emphasis on tumor immunotherapy. 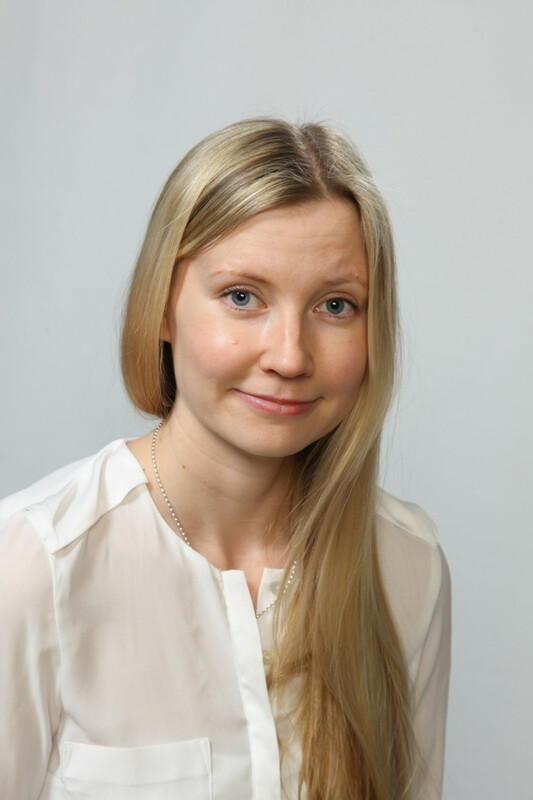 She completed her PhD thesis at the Cancer Gene Therapy Group, University of Helsinki and has previous biotechnology experience from Ark Therapeutics, Kuopio, Finland. 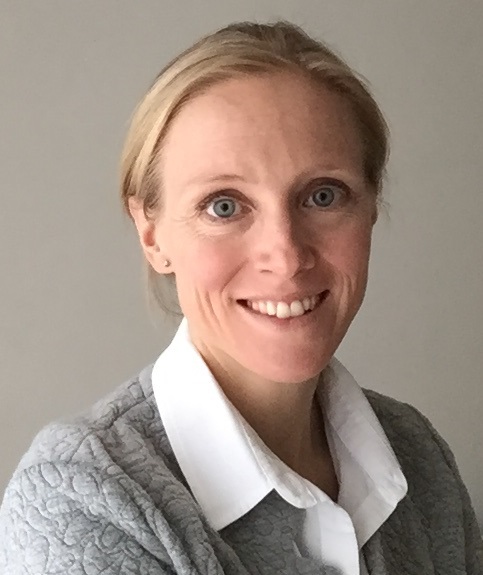 In 2015, Suvi joined TILT Biotherapeutics as Head of Research and Development and is currently responsible for TILT´s clinical research and clinical sample analysis. She has been involved in the development of the TILT´s viruses at every level – from initial studies in mouse models, through regulatory review, and now translating the preclinical research into clinical development. 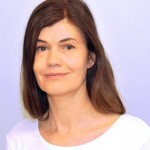 Initially trained in both molecular biology and business, Aino Kalervo has years of international experience with biopharmaceutical strategy and collaborations. Previously she worked at Sanofi in Paris, where among other biological products she got interested in viral vectors while prospecting for biotechs within Sanofi’s contract manufacturing organization. Before joining TILT in 2016 as the Head of Business Management, she worked with therapeutic vaccines as a Business Development Manager in a French biotech company, being the key person in structuring and initiating partnering activities. At TILT she is responsible for all aspects of business, including fund raising, business development, and bridging the gap from breakthrough science to product success. 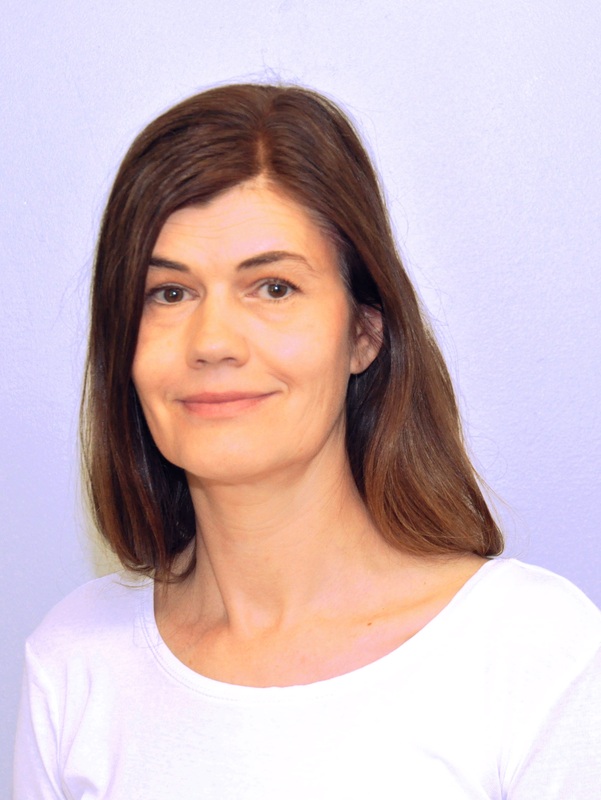 Elina Haavisto holds a Masters in Biology from the University of Turku and has 10 years of clinical and industrial experience in oncolytic adenoviruses. 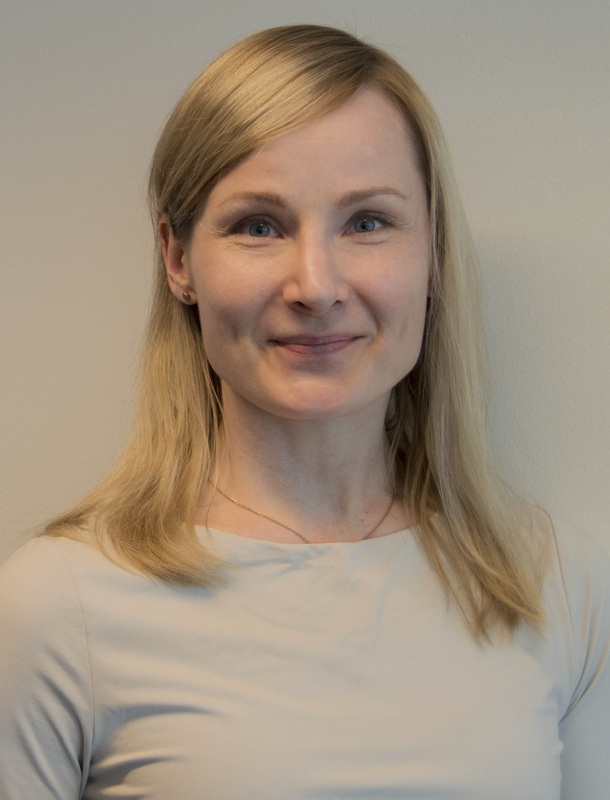 First at University of Helsinki during the Advanced Therapy Access Program and then at Oncos Therapeutics Ltd. (currently Targovax ASA), she has gained a broad experience in CMC, regulatory and adenovirus GMP manufacturing. Before joining TILT in 2017, Elina worked as a Biosafety Manager at Targovax, managing the communication and documentation concerning genetically modified organisms in preclinical and clinical studies. 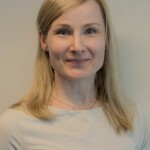 At TILT, Elina is responsible for the management of the outsourced virus manufacturing, overseeing the preparation of regulatory documentation and management of the trial sites. 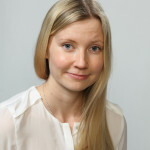 Elina has gained experience at all levels of pharmaceutical product development, from basic research to clinical trials. Riikka Kalliokoski graduated as a biomedical laboratory scientist in Savonia University of Applied Science. She has previously worked in the Department of Health Security of National Institute for Health and Welfare and has gained experience in preclinical drug discovery from Lead Discovery Center in Germany. In 2017 Riikka joined the TILT team as Laboratory Manager, being responsible for non-GMP production and optimization of TILT´s novel product candidates and supporting the process development towards clinical grade batches. In addition to the laboratory work, she operates TILT´s quality management system. 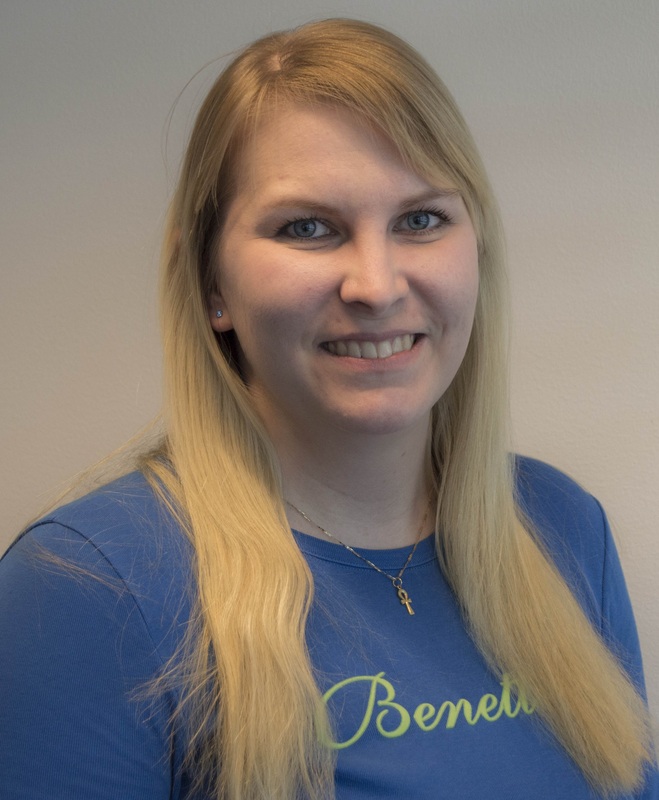 After completing a Master’s degree in cell and molecular biology, Riikka joined the Cancer Gene Therapy Group at the University of Helsinki in 2014 and is expected to earn her PhD degree later in 2018. During her academic career, she has become a highly skilled expert in oncolytic viruses and cancer immunotherapy. 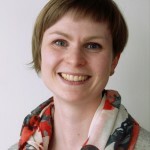 Riikka had a key role in development of TILT´s leading candidate, TILT-123, which is also the main focus of her PhD thesis. 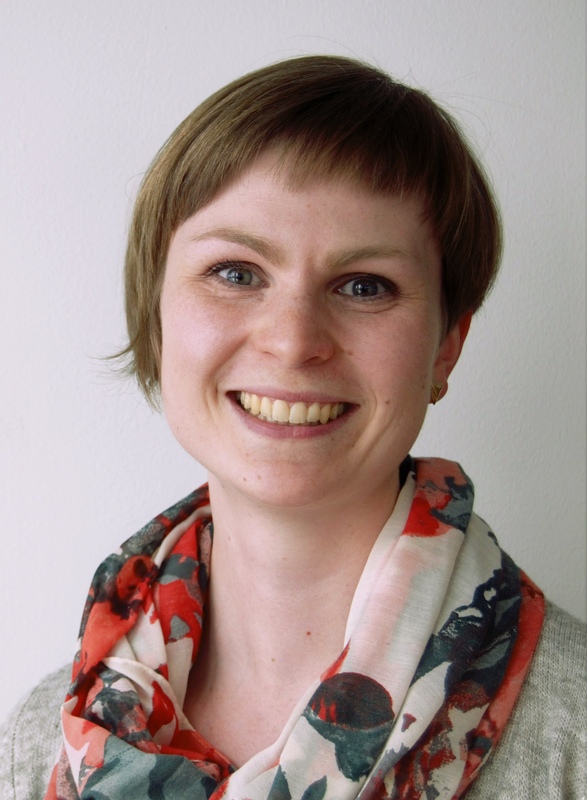 Since 2017, Riikka has been part of TILT team and now heads CMC activities and translating the preclinical research into clinical development. 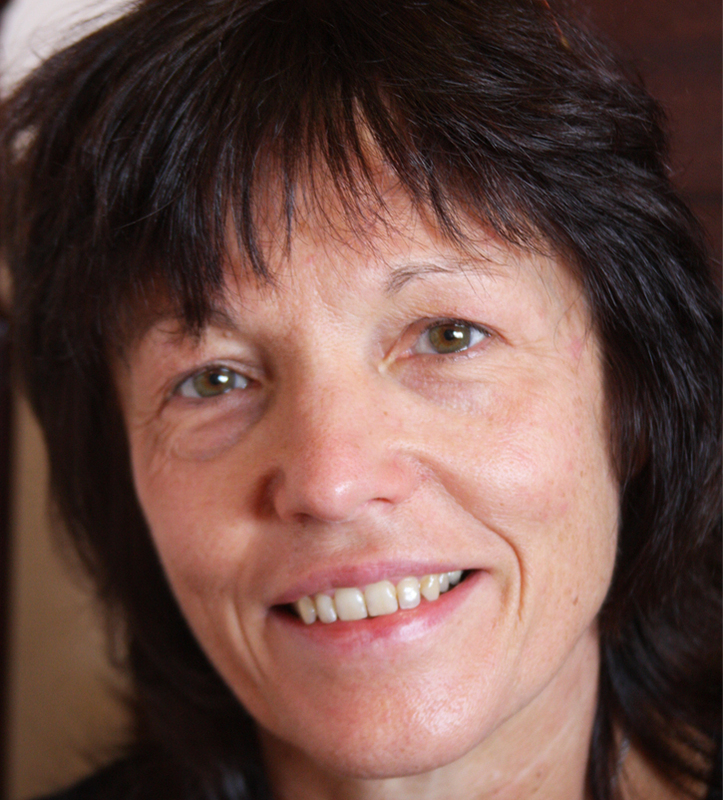 Claudia obtained her PhD in cellular biology at Max-Planck-Institute for Medical Research (Heidelberg, Germany) and subsequently worked at the German Cancer Research Center where she specialised in immunology and oncology. She switched to clinical research in 2006 and worked several years in a global CRO focusing on international trials in oncology. Additional studies in Clinical Research and Regulatory Affairs complement her professional profile. 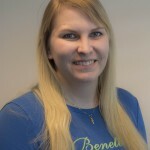 Before she joined TILT in April 2018, she worked in a toxicological project at the European Chemicals Agency in Helsinki. After a Master of Pharmacy with a thesis on oncolytic viruses in Spain, Victor started his PhD studies in the field of immunotherapy taking part in a EC-sponsored industrial Marie Skłodowska-Curie consortium between actors in Netherlands and Finland. Most of his time was spent at TILT Biotherapeutics where he worked on the use of oncolytic viruses to enable immune checkpoint blockade and other T-cell related approaches. 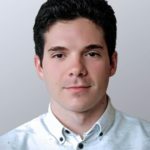 The uniqueness of the Marie Curie PhD programme linking cutting edge science with biotech business allowed him to develop a solid background in scientific, clinical, and industrial aspects of cancer immune therapies. 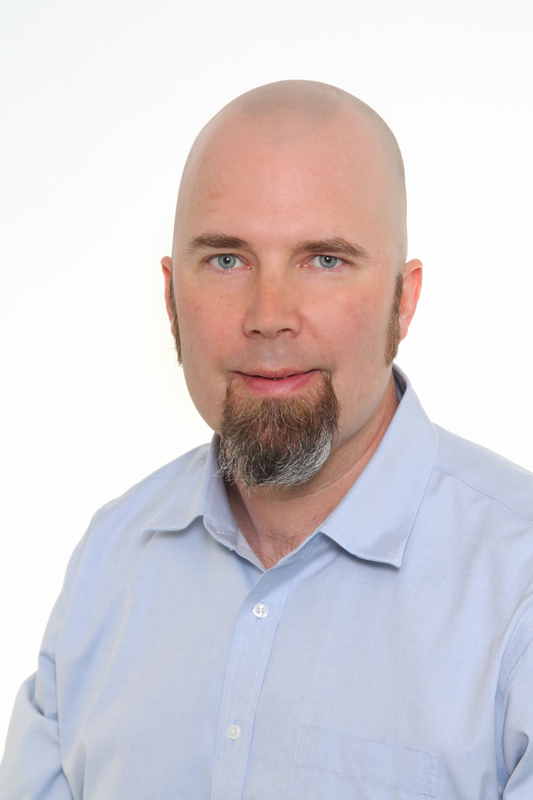 In late 2018, Victor joined the TILT-team as the Head of Immunology. 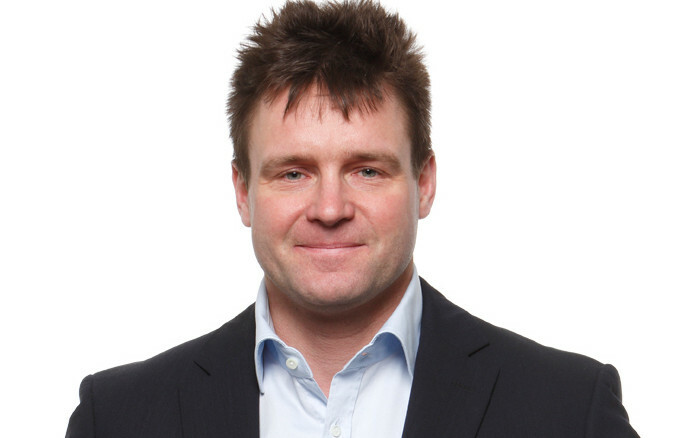 He continues to carry out research, participate in translating preclinical success into clinical trials, as well as support business development activities. Several patent protected products are in early stage development. The first clinical trials with the lead product are expected to start within next year. A Phase 1 clinical trial in metastatic melanoma in patients receiving TILs and TILT-123 is to be carried out in France and Denmark. An additional clinical trial is also planned using TILT-123 in combination with a checkpoint inhibitor in refractory solid tumors. Lastly, a clinical trial with TILT-123 and a CAR-T product is envisioned with a collaborator in the U.S. Regulatory work with both EMA and FDA is ongoing. While T-cell therapies and checkpoint inhibitors have experienced some recent clinical breakthroughs in the treatment of melanoma, leukemia and other tumors, in most trials there is still room for improvement in efficacy. In fact, in most trials most patients have not benefited from treatment. The best results in T-cell therapy trials, especially with tumor-infiltrating lymphocytes (TIL), have been obtained when high dose chemotherapy, with or without whole body irradiation were used as pre-conditioning regimens to enhance the effect of the T-cell graft. In fact, many experts in the field feel that with conventional TIL technology, these highly toxic conditioning regimens are required for efficacy. Moreover, most TIL trials utilize high dose IL-2 (previously known as T-cell growth factor) as a post-conditioning regimen to prolong the activity and viability of the graft. However, both pre- and post-conditioning are toxic regimens causing adverse events including deaths. The patented TILT® technology is based on novel oncolytic viruses coding for cytokines. The constructs are unique in structure, sequence and function. Formal patentability and freedom to operate searches have underlined the uniqueness of the TILT approach. Preclinical laboratory work has already indicated that TILT® technology results in dramatic increases in efficacy in rodent models of T-cell therapy. 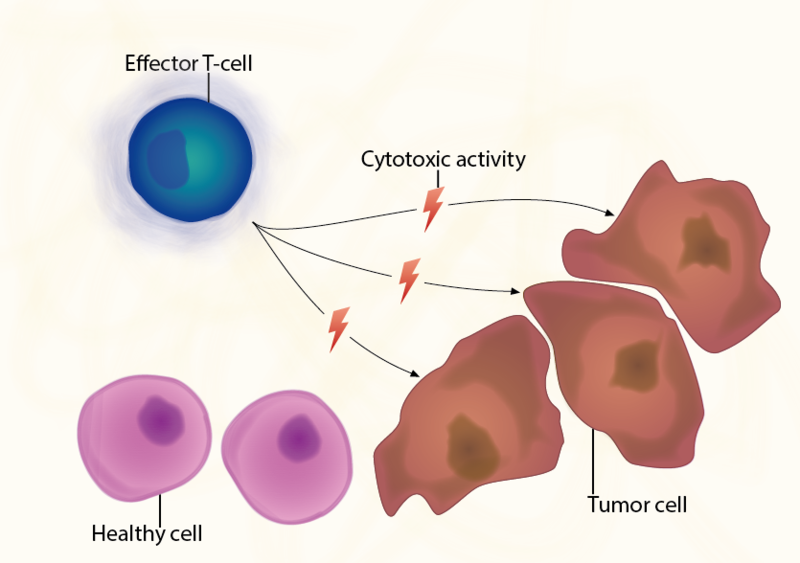 Moreover, mechanism of action studies suggests enhancement of both the recruitment and the anti-tumor activity of the T-cell graft. Importantly, preclinical studies have shown that TILT technology allows retained or increased efficacy in the absence of pre- and post-conditioning chemotherapy and IL-2. 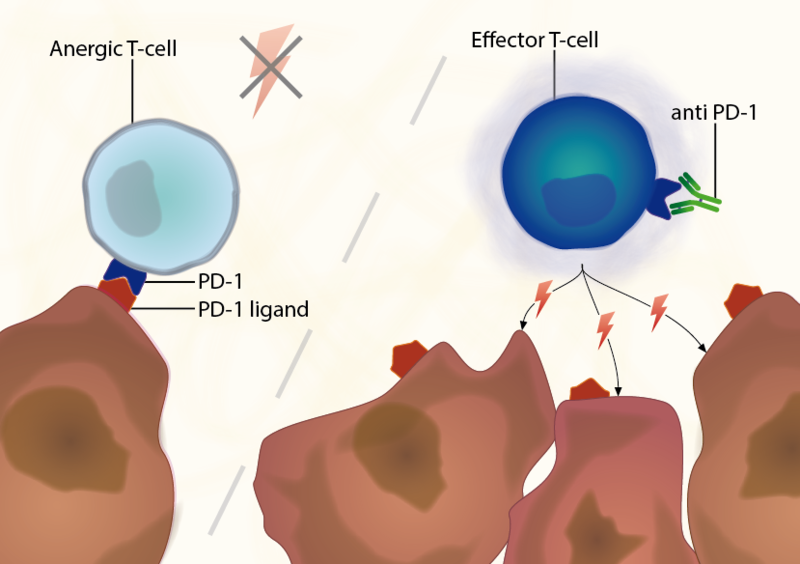 Another form of T-cell therapy, checkpoint inhibiting anti-PD1 antibodies, are emerging as a new way of treating cancer in addition to surgery, radiation, and chemotherapy. In spite of the recent marketing approvals of checkpoint inhibiting antibodies, the challenge remains to extend treatment benefits of these products to the 50-90% of patients who do not receive long term benefits. 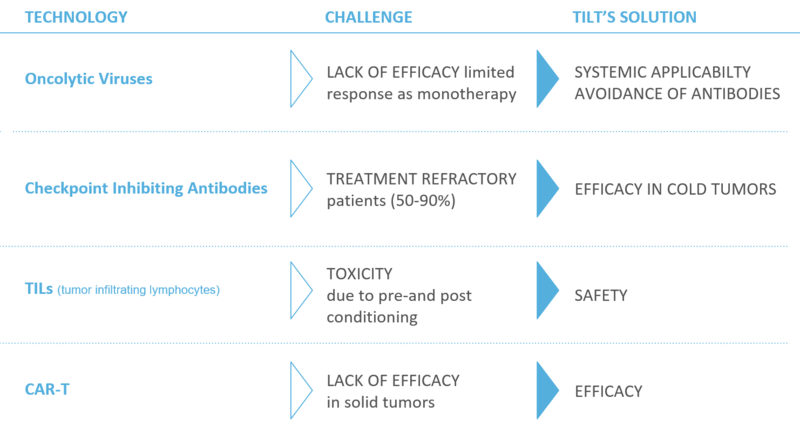 TILT’s novel proprietary oncolytic viruses enable T-cell therapy and checkpoint inhibiting antibodies of solid tumors. 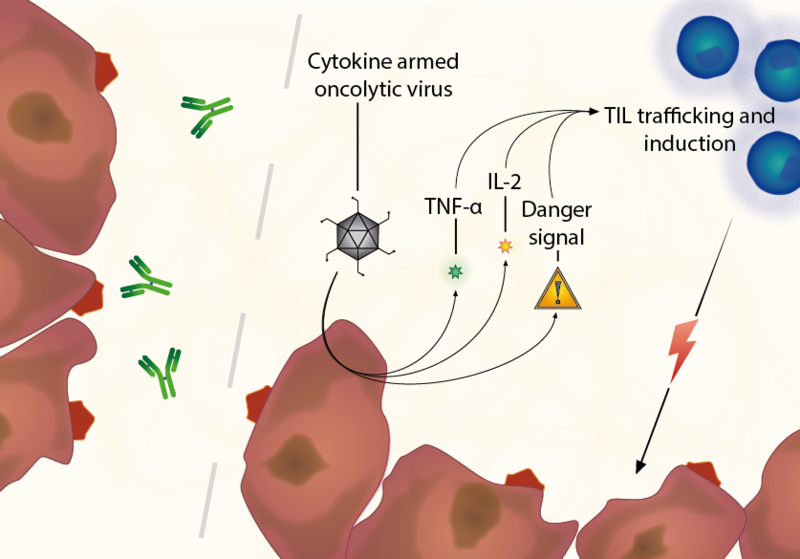 Checkpoint inhibition only works in immunologically “hot” tumors, featuring tumor infiltrating lymphocytes (TIL), neoantigens and PD1L expression. TILT’s lead product, TILT-123, can convert “cold” and immunologically excluded tumors into “hot” tumors, increasing the response rate to checkpoint inhibition in any solid tumor indication. While chimeric antigen receptor (CAR) modified T-cell have already worked well in trials with hematological cancer patients with CD19+ tumors, in solid tumors the results have been disappointing. Our technology has the potential to overcome the identified obstacles for realizing the potential of CAR technology in solid tumors. Thus, with the TILT® approach, it may be possible to obtain similar results in solid tumors as currently seen in CD19+ leukemias. Havunen R, Santos JM, Sorsa S, Rantapero T, Lumen D, Siurala M, Airaksinen A, Cervera-Carrascon V, Tähtinen S, Kanerva A & Hemminki A. Abscopal Effect in Non-injected Tumors Achieved with Cytokine-Armed Oncolytic Adenovirus. Molecular Therapy - Oncolytics, 2018. Santos, JM, Cervera-Carrascon V, Havunen R, Zafar S, Siurala M, Sorsa S, Anttila M, Kanerva, A. 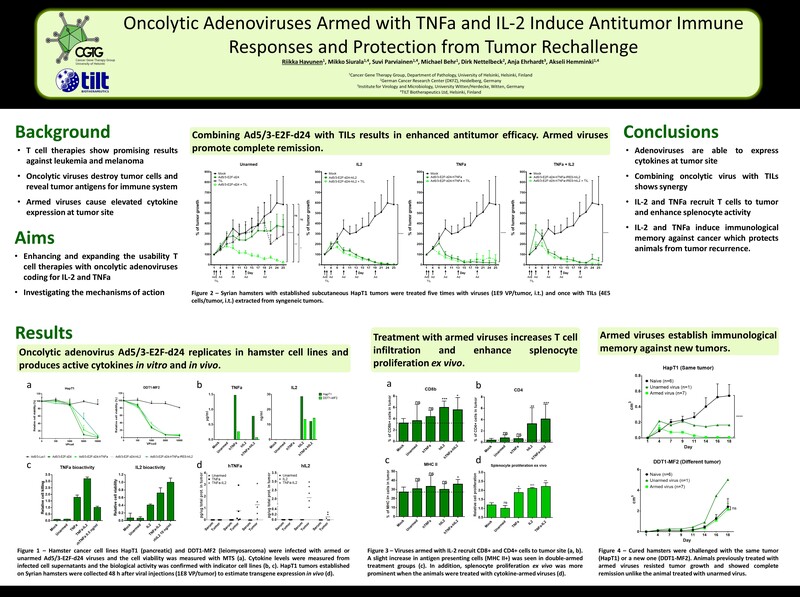 & Hemminki, A. Adenovirus Coding for Interleukin-2 and Tumor Necrosis Factor Alpha Replaces Lymphodepleting Chemotherapy in Adoptive T Cell Therapy. Molecular Therapy, 2018. 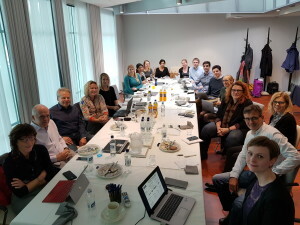 Watanabe K, Luo Y, Da T, Guedan S, Ruella M, Scholler J, Keith B, Young RM, Engels B, Sorsa, S, Siurala M, Havunen R, Tähtinen S, Hemminki A. & June CH. Pancreatic cancer therapy with combined mesothelin-redirected chimeric antigen receptor T cells and cytokine-armed oncolytic adenoviruses. JCI Insight, 2018. Zafar S, Sorsa S, Siurala M, Hemminki O, Havunen R, Cervera-Carrascon V, Santos JM, Wang, H, Lieber A, De Gruijl T, Kanerva A. 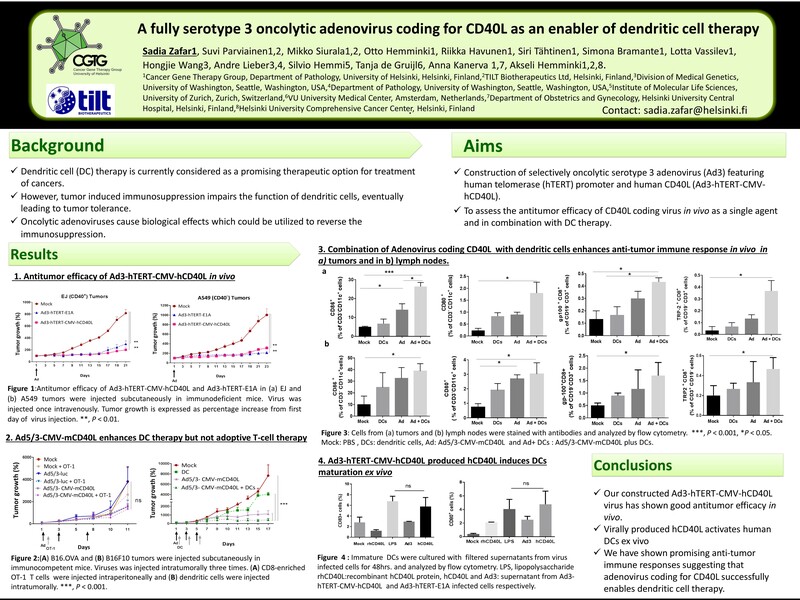 & Hemminki A. CD40L coding oncolytic adenovirus allows long-term survival of humanized mice receiving dendritic cell therapy. Oncoimmunology, 2018. Cervera-Carrascon V, Siurala M, Santos JM, Havunen R, Tähtinen S, Karell P, Sorsa S, Kanerva A, Hemminki A. TNFa and IL-2 armed adenoviruses enable complete responses by anti-PD-1 checkpoint blockade. Oncoimmunology. 2018 Apr 9;7(5):e1412902. doi: 10.1080/2162402X.2017.1412902. Santos JM, Havunen R, Siurala M, Cervera-Carrascon V, Tähtinen S, Sorsa S, Anttila M, Karell P, Kanerva A, Hemminki A.
Adenoviral production of interleukin-2 at the tumor site removes the need for systemic postconditioning in adoptive cell therapy. Int J Cancer. 2017 Oct 1;141(7):1458-1468. Zafar S, Parviainen S, Siurala M, Hemminki O, Havunen R, Tähtinen S, Bramante S, Vassilev L, Wang H, Lieber A, Hemmi S, de Gruijl T, Kanerva A, Hemminki A. Intravenously usable fully serotype 3 oncolytic adenovirus coding for CD40L as an enabler of dendritic cell therapy.Oncoimmunology. 2016;6(2):e1265717. 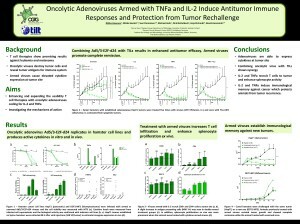 Tähtinen S, Blattner C, Vähä-Koskela M, Saha D, Siurala M, Parviainen S, Utikal J, Kanerva A, Umansky V, Hemminki A.
T-Cell Therapy Enabling Adenoviruses Coding for IL2 and TNFa Induce Systemic Immunomodulation in Mice With Spontaneous Melanoma. J Immunother. 2016;39(9):343-354. Siurala M, Havunen R, Saha D, Lumen D, Airaksinen AJ, Tähtinen S, Cervera-Carrascon V, Bramante S, Parviainen S, Vähä-Koskela M, Kanerva A, Hemminki A. Adenoviral delivery of tumor necrosis factor-a and interleukin-2 enables successful adoptive cell therapy of immunosuppressive melanoma. Mol Ther. 2016 Aug;24(8):1435-43. Tähtinen S, Kaikkonen S, Merisalo-Soikkeli M, Grönberg-Vähä-Koskela S, Kanerva A, Parviainen S, Vähä-Koskela M, Hemminki A. Favorable Alteration of Tumor Microenvironment by Immunomodulatory Cytokines for Efficient T-Cell Therapy in Solid Tumors. PLoS One. 2015;10(6):e0131242. T-cells can recognize and kill abnormal cells such as tumor cells. Alternatively, T-cells can be activated at the tumor with checkpoint inhibiting antibodies such as anti-PD1 or anti-PD1L. It does not work on immunologically silent tumors, where the amount of TILs is low. Silent tumors can be made visible by the use of the virus TILT-123. Adenoviruses are potent danger signals for the immune system (detected through PAMP receptors). To enhance the danger signal, TILT-123 was engineered to express human TNFa and human IL-2. These transgenes were selected from a large panel as they showed the best synergy with T-cell therapy. TNFa -> danger signaling, trafficking to the tumor. IL2 -> T-cell activation, propagation, reversion of exhaustion. Another mechanism by which TILT technology improves the antitumor response is immunogenic cell death (ICD). ICD results from cell lysis (“burst”) which releases tumor antigens, viral DNA, more virions to infect new cells. 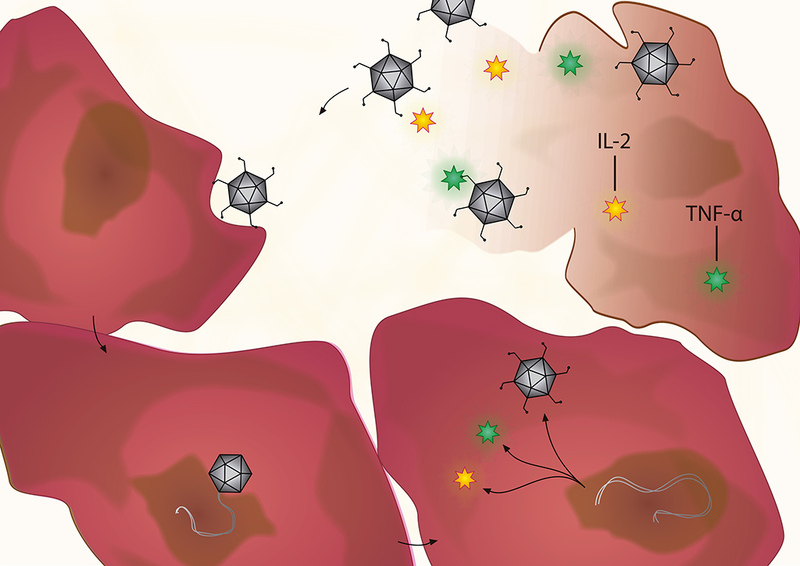 The cytokines featured in TILT-123 increase ICD. Preconditioning regimens are compared: high dose chemo +/- full body radiation. PhD position is open at TILT Biotherapeutics Ltd within the context of the recently granted European Industrial Doctorate project STACCATO – European Industrial Doctorate for enhancing upstream biopharmaceutical manufacturing process development through single cell analysis. Read more here and apply by 28.2.2019. 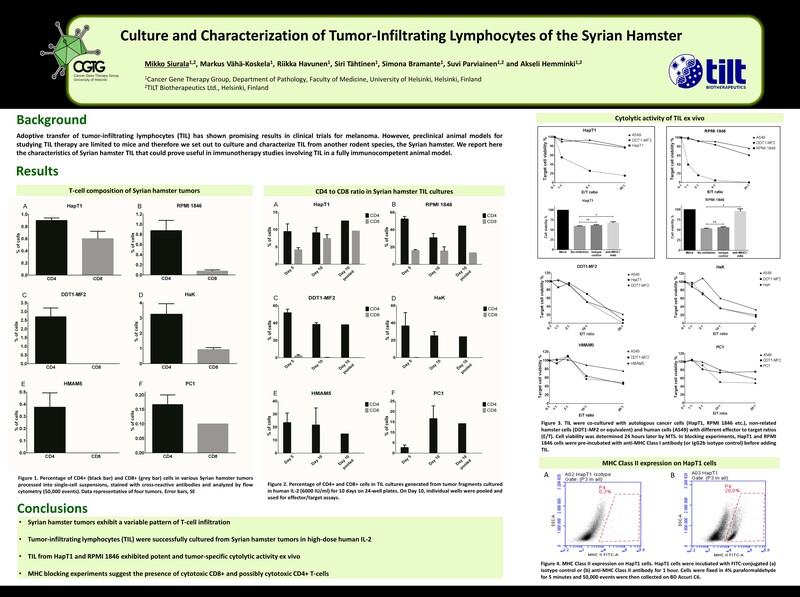 Poster featuring TILT technology was presented at the AACR Tumor Immunology and Immunotherapy meeting in Miami, USA in November 2018. TILT´s Head of R&D Riikka Havunen successfully defended her PhD thesis “Enhancing adoptive cell therapy of solid tumours with armed oncolytic adenoviruses” on 9th of November 2018. 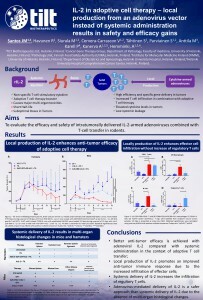 Riikka´s thesis describes the characterization and key preclinical results of TILT-123. Congratulations! European patent was granted for TILT´s patent Enhancing adoptive cell therapy in November 2018. TILT Biotherapeutics Ltd, NIBRT (Ireland), Becton Dickenson (Ireland), Instituto de Biologia Experimental e Tecnológica (Portugal), KTH Royal Institute of Technology (Sweden), Paul Ehrlich Institute (Germany) are partners in STACCATO “European Industrial Doctorate for enhancing upstream biopharmaceutical manufacturing process development through single cell analysis” network. 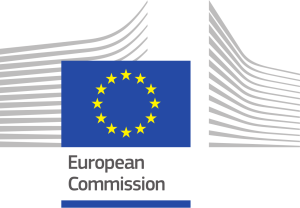 STACCATO is funded by Marie Skłodowska-Curie Actions (MSCA) programme of Horizon 2020. Read NIBRT´s press release here. 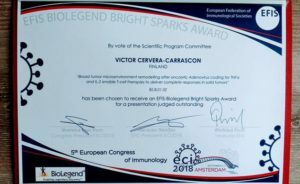 Victor Cervera-Carrascon was awarded with the EFIS-Biolegend Bright Sparks Award for his presentation entitled “Broad tumor microenvironment remodelling after Oncolytic Adenovirus coding for TNFa and IL-2 enables T-cell therapies to deliver complete responses in solid tumors” at European Congress of Immunology in Amsterdamin September 2018. 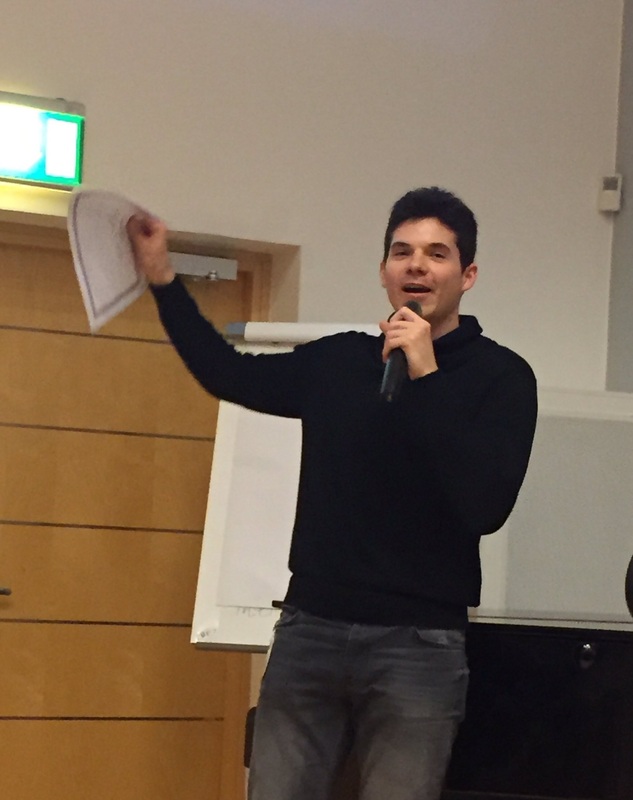 View and listen Akseli Hemminki’s pitch at 2018 Bio International Convention held in Boston in June. TILT won a grant for a 2.5 M€ (~$ 2.9M) project, entitled UNLEASHAD, from the European Commission EIC SME Instrument. The grant will be used to perform a Phase 1 clinical trial with the company’s lead drug, TILT-123. Read the press release here. 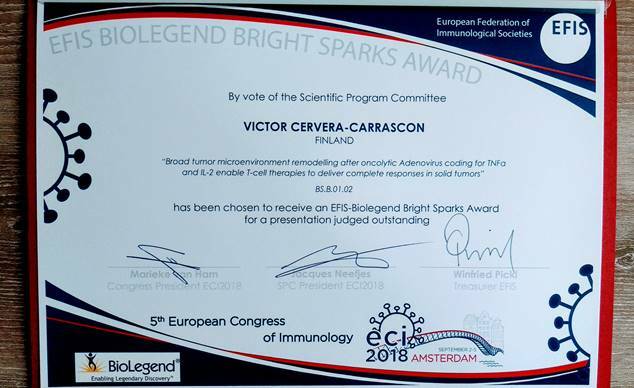 TILT technology scored within the top 1% of abstracts at European Congress of Immunology (Amsterdam 2-5.9.2018); oral presentation by Victor Cervera-Carrascon. Head of R&D Riikka Havunen was awarded oral presentation “Oncolytic adenoviruses armed with tumor necrosis factor alpha and interleukin-2 enable treatment of solid tumors with T cell therapies” at the 16th Cancer Immunotherapy Annual Meeting in Mainz, Germany in May 2018. 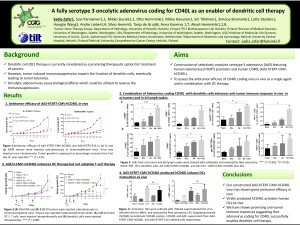 Poster of the presentation was also presented in the meeting. 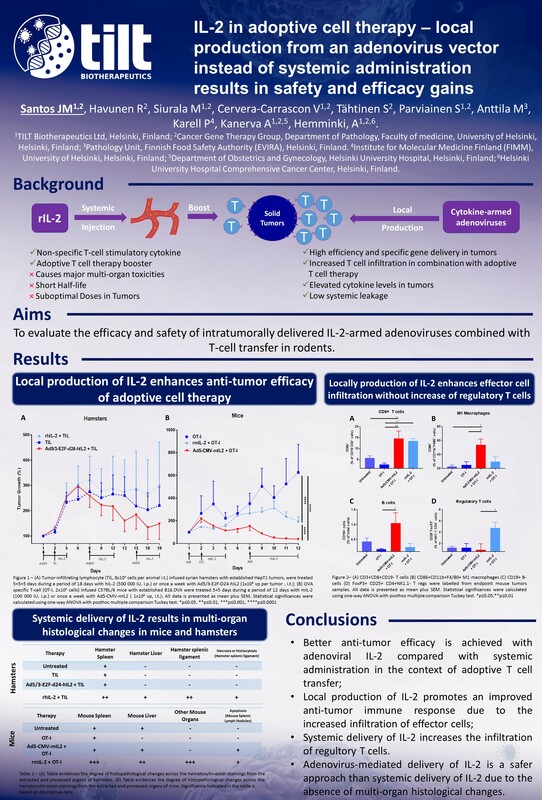 Posters featuring TILT technology presented at the 11th International Oncolytic Virus Conference in Oxford in Oxford, UK, in April 2018. 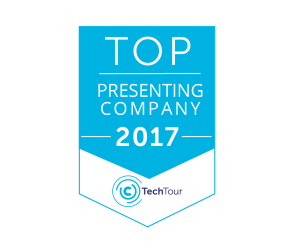 TILT Biotherapeutics recognized as one of Tech Tour’s top presenting companies at the European Venture Contest Final in Düsseldorf. Santos et al. Poster. ESMO IO 2017. Cervera-Carrascon et al. Poster. ESMO IO 2017. 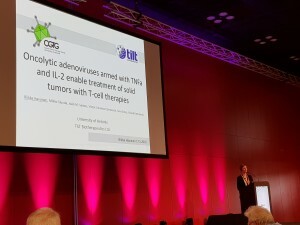 TILT science presented at the Cancer Immuntherapy and Immunomonitoring (CITIM) conference in Prague in April 2017. 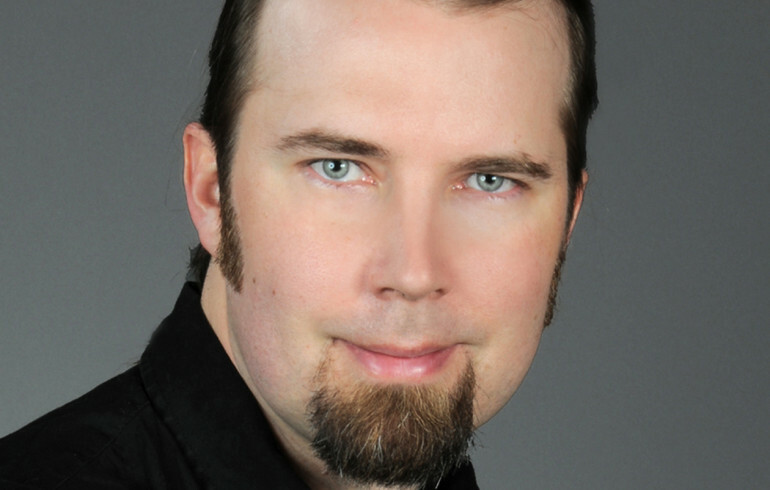 Read Akseli Hemminki´s interview from the latest issue of Human Vaccines and Immunotherapeutics. Available also here. TILT Biotherapeutics was highlighted as one of the key companies developing oncolytic viruses in an interesting report entiteled ” A New Wave of Cancer Therapies: Local Tumor Immuno-Rx Drives Distant Effects”, published by Piper Jaffray & Co. 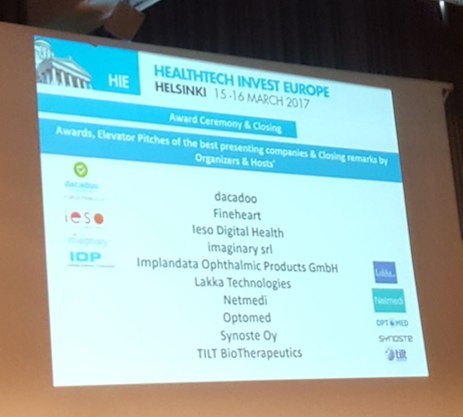 TILT was awarded as one of the best presenting companies at HealthTech Invest Europe. 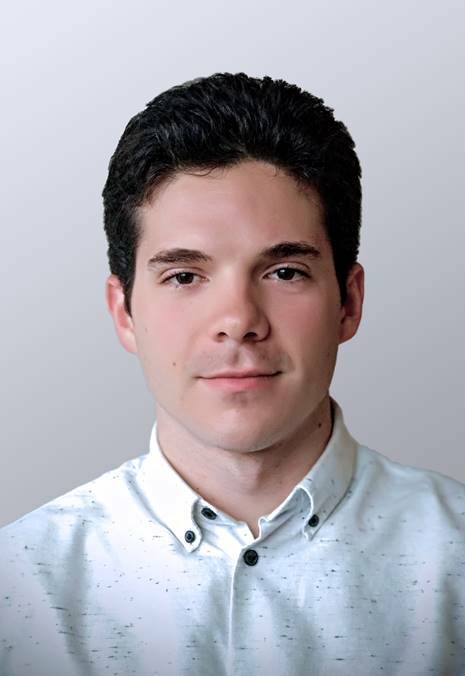 Joao Santos and Víctor Cervera-Carrascón were awarded oral presentations at the Netherlands Society of Gene and Cell Therapy Spring Symposium in Lunteren, the Netherlands. TILT Biotherapeutics was featured in the latest issue of BioPharma Dealmakers. 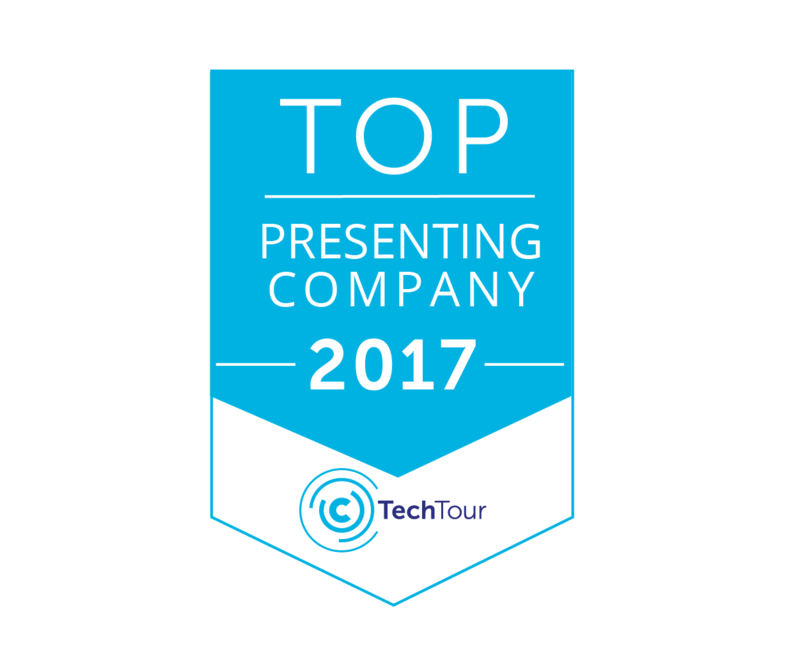 TILT Biotherapeutics won second prize in Merck´s Emerging Biotech Grant Program. More information and all the grant receipients can be found here. Open position for Head of Production is available at TILT Biotherapeutics. Application deadline is 13.2.2017. 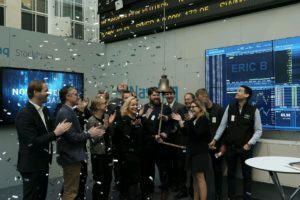 Elina Haavisto starts as Head of Regulatory and Riikka Kalliokoski as Lab Manager at TILT. 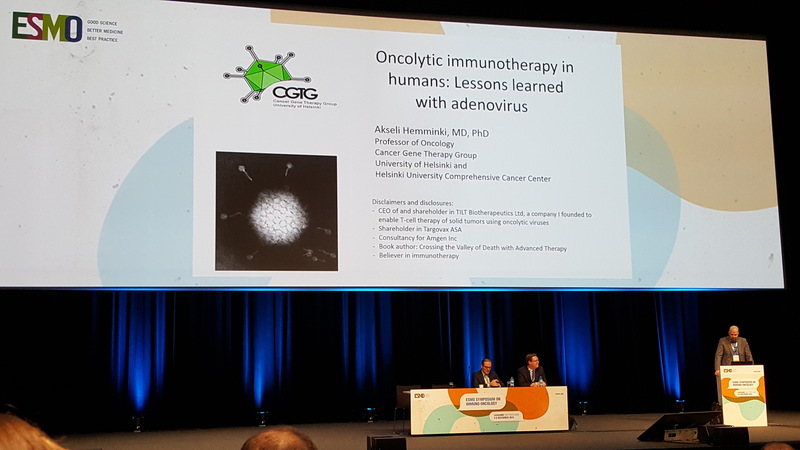 Akseli Hemminki gave an invited talk at the European Society for Medical Oncology Symposium on Immuno-Oncology 2016. Suvi Parviainen was awarded a travel grant for the meeting and her abstract was chosen in poster discussion session. Poster featuring TILT technology will be presented at the Society for Immunotherapy of Cancer (SITC) Annual Meeting in Washington DC, USA in November. Poster featuring TILT technology will be presented at the European Society of Cell and Gene Therapy Annual Congress in Florence, Italy in October 2016. TILT Biotherapeutics Ltd, VU University medical center and ORCA Therapeutics are partners in EU funded The Viruses, Immune stimulation and RNA Interference in Oncology –Network (VIRION). 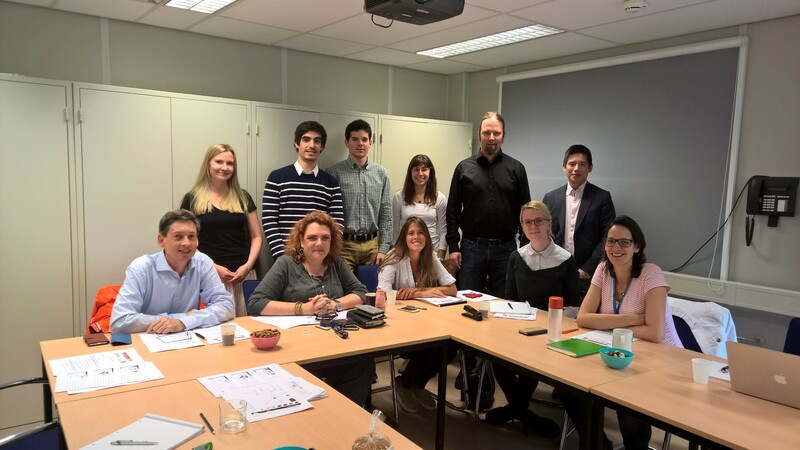 First consortium meeting was held in Amsterdam in September. 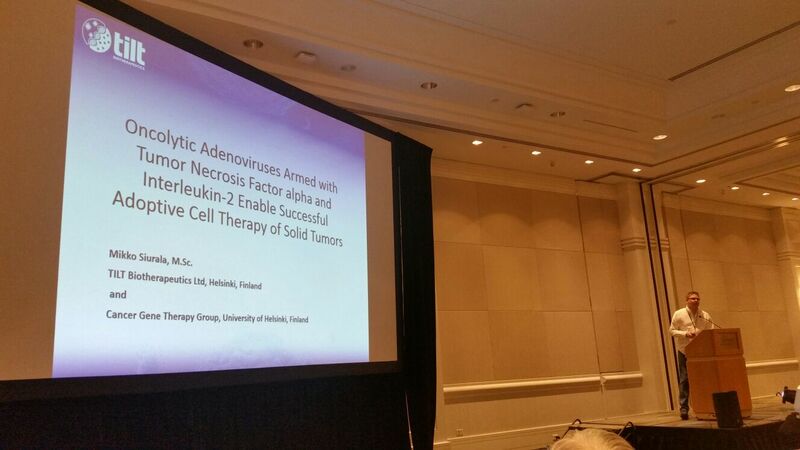 Head of Preclinical Science Mikko Siurala was awarded oral presentation at the International Conference on Oncolytic Virus Therapeutics, Vancouver, Canada. TILT Biotherapeutics featured in European Biotechnology Vol.15 2016. 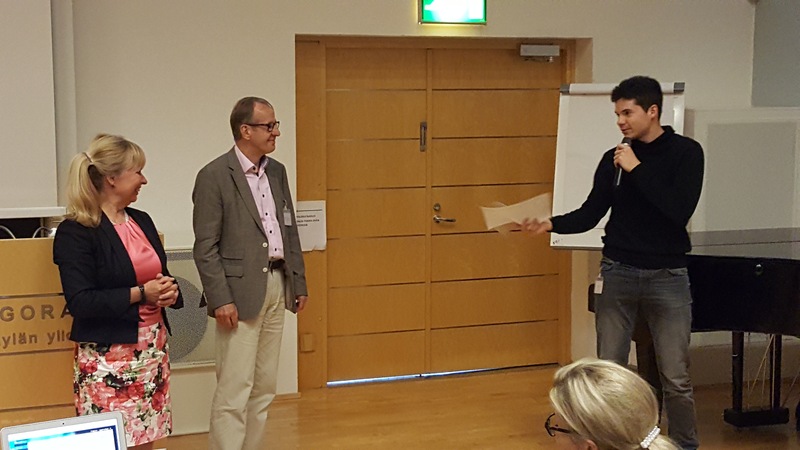 16.6.2016 Víctor Cervera-Carrascón, an EU funded student working at TILT wins poster award for his work with anti-PD1 checkpoint inhibition enhanced by TILT technology at Finnish Cancer Institute Symposium. TILT Biotherapeutics Ltd, VU University medical center (VUmc) and ORCA Therapeutics announce EU funded Marie Curie Early Stage Researcher positions starting in early 2016. 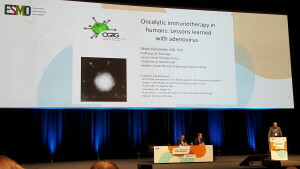 Akseli Hemminki presents on Oncolytic vaccines for treatment of cancer at the Progress in Vaccination against Cancer meeting in Amsterdam, the Netherlands. Seed funding round closed following investments by angels, Lifeline Ventures Fund, Finnish government (TEKES) and Finnish Invention Fund (Keksintösäätiö).